Demonstrators raise their fists in protest of President Trump's attempts to end the Deferred Action for Childhood Arrivals (DACA), an executive action made by President Obama that protected minors known as Dreamers who entered the country illegally from deportation, outside of the U.S. Capitol in Washington, USA on March 5, 2018. 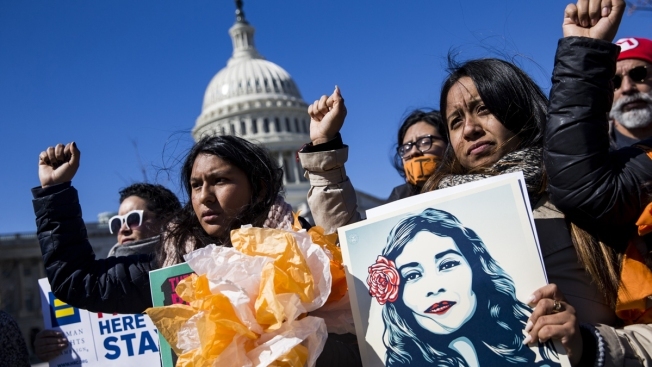 A third federal judge on Tuesday ruled against the Trump administration's campaign to end the Deferred Action for Childhood Arrivals program for undocumented immigrants, ordering the administration not only to continue processing applications but also to resume accepting new ones. U.S. District Judge John Bates of the District of Columbia was withering in his 60-page ruling, calling the administration's attempts to end the program, known as DACA, "arbitrary," "capricious," "virtually unexplained" and "unlawful," NBC News reported. Bates stayed the ruling for 90 days to give the Department of Homeland Security time to come up with better arguments for scrapping the program. If it doesn't, he wrote, he will enter an order reinstating DACA in its entirety.